by wangdu on September 14, 2013 in News, Rigul Trust. Rigul, Kham, Tibet, Ringu Tulku’s birthplace, may become the first Tibetan village to be adopted by a UK town. 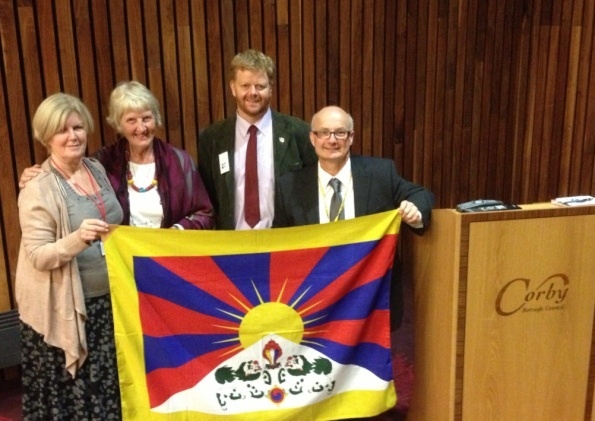 Here is a report from the Tibet Society of a meeting in Corby on the 11th September, that Margaret Richardson, trustee of Rigul Trust, attended and gave a presentation of how Rigul Trust helps in Tibet. Corby in Northamptonshire could become the first council in the UK to ‘adopt’ a Tibetan village. Tibet Society have supported the plans which will help to highlight the human and civil rights issues in Tibet. The council will vote on the motion on Thursday 19 September. The motion, proposed by the Jean Addison, Deputy Leader of Corby Council, proposes the ‘adoption’ of the remote village of Rigul in Kham (now incorporated into Sichuan province). The initiative is similar to twinning, however this process requires no funding nor does it require the involvement of the Chinese government. If the motion passes then the Council will consider ways to promote the Tibet issue, with the assistance of Tibet Society, and separately fundraise for projects which will benefit Rigul village. The Council votes on the motion on Thursday 19 September. The idea for the adoption came from Councillor Bob Riley who had heard of similar schemes in France. Councillor Riley contacted Tibet Society and said he wanted to not only assist development projects but also highlight the plight of the Tibetan people. On Wednesday 11 September, Paul Golding, Tibet Society’s Campaigns Coordinator, gave a presentation to members of Corby Council, describing the current issues facing Tibetans living in Tibet. France24’s undercover video report from inside Tibet earlier this year was shown and recent prisoner cases were highlighted, including Dolma Gyab (sentenced to death for the alleged murder of his wife) and Ngawang Tobden (student imprisoned for two years for having ‘subversive’ images on his mobile phone). The UK-based Rigul Trust also gave a presentation to the Council, about Rigul and the projects it funds. Rigul is a remote village high in the mountains of Kham. According to Rigul Trust, “The people of Rigul have been gradually rebuilding their lives after years of destruction following the Chinese invasion. Through many bleak years they experienced extreme poverty and hard labour”. The projects include sanitation improvements and the building of education facilities and a health clinic. Tibet Society will be developing plans to encourage other councils across the UK to adopt Tibetan towns and villages. Details will be announced soon. Dear Margaret, congretulations. So good and well done. Hope it works out as Rigul Trusts aspires, visions. love x.